Cute and animals go together in online gaming like Playtech and big-name tie-ins. 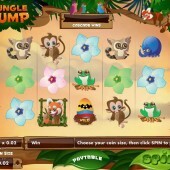 But Gamesys have done it again with their 25-payline online slot, Jungle Jump. Played out over five reels, the graphics are simplistic and colorful (perfect for the inevitable mobile version of the game that is surely imminent) and has some interesting features. What's most attractive about the slot is that it employs the 'cascading reels' style of play that you see in other developers' games. If you hit a winning combination on the reels, the winning icons vanish and allow the symbols above to drop down into their place. This can lead to even bigger wins on a single spin. Cartoonish jungle animals occupy most of the spots - other than four different colors of flowers - with a fox, monkey, raccoon, frog, and beetle making up the numbers. The cracked egg is the Wild and substitutes for all regular symbols in the game other than the Scatters. The colorful butterfly Scatter pays anywhere but won't help trigger any special bonus features. That honor is saved for the Cascading Reels feature in the base game. 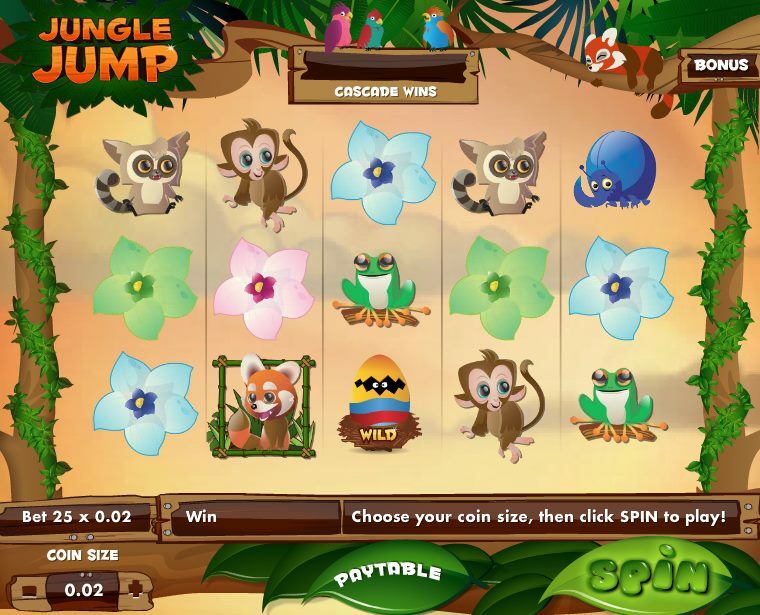 If you land four consecutive wins on the main reels you will trigger the Jungle Jump bonus round. You will be taken to a second screen with a series of leaves for our friendly fox to jump onto as he tries to catch the butterfly. Click on a leaf for our furry pal to jump onto it, and if he catches the butterfly he will bag you some lovely cash. That's your lot for bonus features, but Jungle Jump is all about the cascading reels you will find in the base game. I love any games with this feature, so how about checking out WMS's sci-fi-themed Invaders From the Planet Moolah or Betsoft Gaming's fantasy-themed Greedy Goblins, both of which have their own take on the familiar tumbling/cascading reels feature.